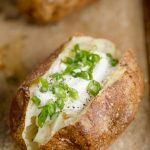 Baked potatoes toppings of your choice sour cream, chives, cheese, etc. Brush potatoes with olive oil and sprinkle generously with salt. Place potatoes on the prepared baking sheet and bake for 50-60 minutes. Cool for 10 minutes. Slice open the tops of the potatoes and pinch the sides to spread open. Top with butter, salt and fresh cracked black pepper. For loaded baked potatoes, top with sour cream, freshly shredded cheddar cheese and bacon.